The catkin. A harbinger of spring. Here are a cluster of male catkins on a hazelnut (Corylus contorta to be sure). Native hazelnut catkins are known to be especially important for the ruffed grouse who use these as an early spring “power bar”. More than a snack, these foods catapult the grouse from a season depauperate of food into a season of more abundant food. The catkins are a light at the end of the tunnel. Notably, Native Americans were known to use Corylus americana medicinally for hives, biliousness, diarrhea, cramps, hay fever, childbirth, hemorrhages, prenatal strength, and teething, to induce vomiting, and to heal cuts (D. E. Moerman, 1986). This is truly a plant whose beauty, nourishment and healing help demonstrate how rich of a world it is that we live in. So what did I do here to “museum finish” this piece…First of all, I took a well exposed picture to start. Since there were a lot of light toned aspects to the picture, I underexposed a third of a stop, reducing the chance I would be falling off the exposure histogram at the light end. Next I looked over textures and found a right orange one with a warmth of fall/winter. Since it was a darker texture, I took the original picture and pushed the exposure “high key” pushing the mids up in brightness. 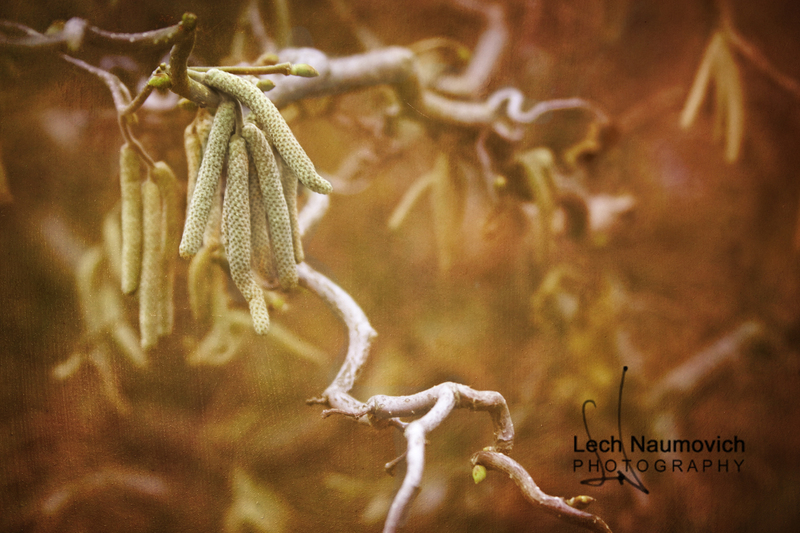 Next I overlayed the texture on the original and using OnOne Layers2, I brushed out any texture in the catkins so that they remain cleaner, softer, and slightly more alluring to the eye. In terms of a good layering software – this one is intuitive, quick and integrates well with other Adobe platforms. Now that layers are available in Photoshop Elements 9 & 10, I would guess this is a more difficult program to “sell” at nearly the same price with much less functionality. But as a Beta tester for this product, I’ve been very happy with the upgraded 2.01 version and recommend it as a standalone product that is much easier to learn that any PSE product. Thanks for reading. And do enjoy the bridge into Spring. Sweet! The orange texture gives it great depth (although the original photo was probably super on its own).